American chestnut catkins starting to bloom. Photo by Keith Kanoti, courtesy of Bugwood.org. The Silvics of American Chestnut , a general technical report (GTR) available from the U.S. Forest Service Southern Research Station (SRS), describes the habitat, life history, special uses, genetics, and restoration of the American chestnut (Castanea dentata). The publication is the result of collaboration between G. Geoff Wang, the lead author, his colleagues at Clemson University, and Stacy Clark, a research forester with the SRS Upland Hardwood Ecology and Management unit. Until the early 20th century, American chestnut was one of the most ecologically, culturally, and economically significant trees of the eastern United States. However, the accidental introduction of an exotic pathogen, the chestnut blight (Cryphonectria parasitica), devastated the chestnut population, causing the species to become functionally extinct. Because of American chestnut’s long absence from the landscape, standard silvicultural handbooks such as the USDA Woody Plant Seed Manual have not included complete information about the species’ life history and growth habits. This publication supplements silvicultural handbooks by summarizing information about American chestnut that will be important to future restoration efforts. 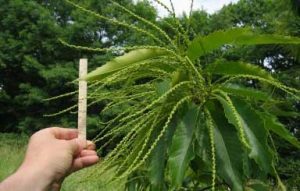 The GTR’s authors point out that restoring chestnut on most sites requires artificial regeneration — growing the blight-resistant trees recently developed in a greenhouse or nursery and planting them as seedlings — rather than starting from seed. They also caution that even if the chestnut trees prove to be blight-resistant, the effects of damaging agents other than blight, including root rot disease and insects that defoliate leaves or damage roots, may represent real barriers to restoration.